The landslide at Dilkusha Road. 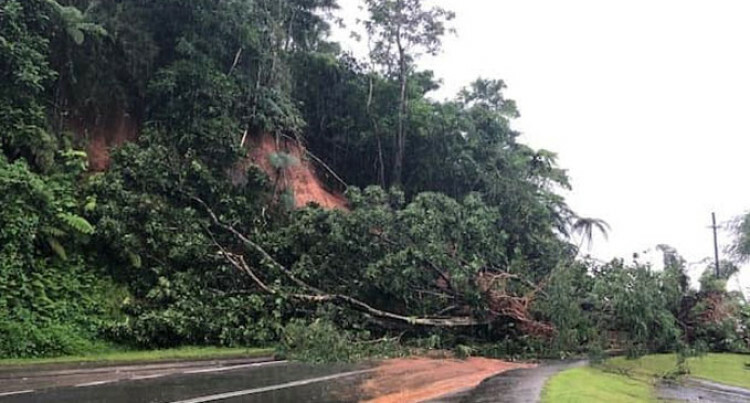 All motorists living along the vicinity of Nausori and Nakasi are advised to make their travel plans now as the Dilkusha Road will be closed due to a landslide. The continuous heavy rain throughout the country has caused flash floods and landslides. Motorists are advised to take precaution on the road. Business owners are also advised to consider the travelling public who will be affected to take the alternative route as some of them will be late to work tomorrow (Monday 21 st January, 2019). Motorists who usually travel through Princess Road are advised to go through the Kings Road. Meanwhile, it is important for parents to ensure the safety of their children. They must not be allowed to swim in flooded rivers or creeks to avoid drowning incidents. Clear blocked drainage around homes to prevent flooding. For motorists, do not attempt to drive through flooded areas. This is the cause of most flood-related deaths in Fiji. The three schools within the vicinity of the landslide are likely to close tomorrow. The schools include Dilkusha Girls School with a school roll of 890, Dilkusha Boys School and Dilkusha High School. The public is advised to continually tune on the radio/TV to get regular instructions and updates on the cyclone and also from the Meteorological Services Website at www.met.gov.fj.